Wireless printing finally comes to the iPhone, iPad and iPod touch this November, and AppleInsider offers a closer look at the feature in its current state in the first iOS 4.2 beta. Developers were given their first taste of printing in iOS 4.2 with the software's beta release on Wednesday. And with it, details of how the process works have been revealed. 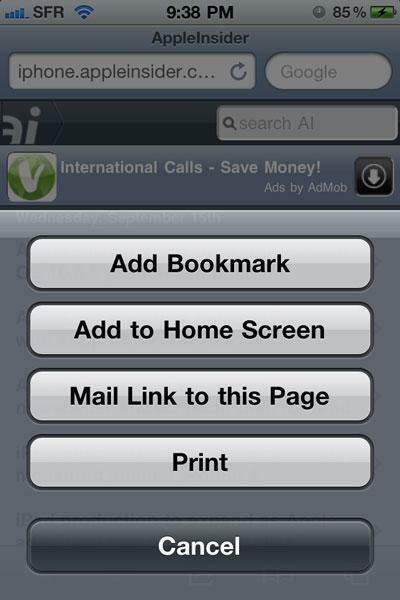 Users invoke printing options in iOS 4.2 through a selection that is available in a navigation bar or toolbar. 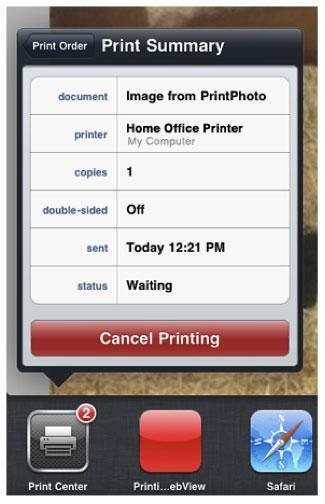 Tapping the button gives options, such as what printer to send the document to and how many copies should be printed. 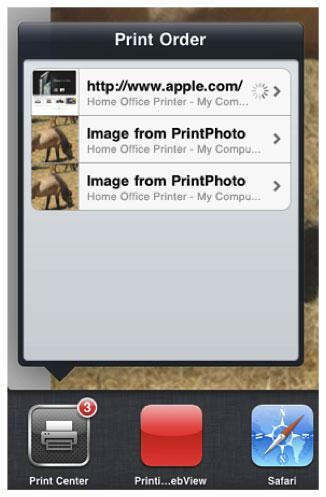 iOS 4.2 also supports more advanced options, such as a range of pages to print, or single-sided or double-sided printing on compatible printers. On the iPad, these options are presented through a popover, as is common in the device's user interface. 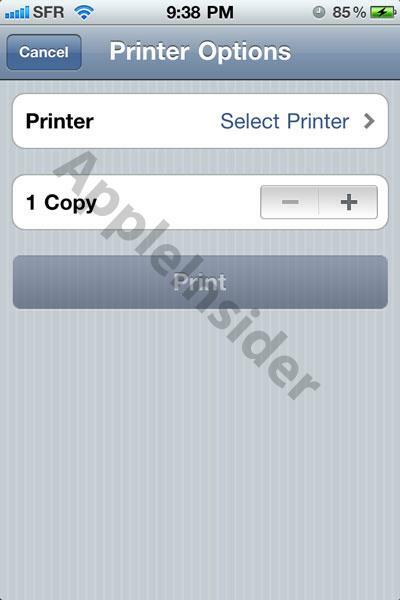 On an iPhone or iPod touch, a full-screen list of printer options is displayed. The status of an active print job can also be viewed in the Print Center button through the multitasking tray. 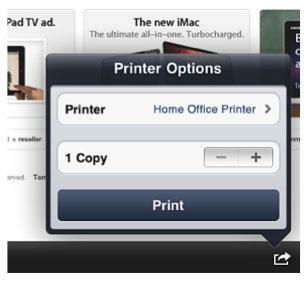 Users simply press the home button twice to select Print Center, which automatically runs in the background on iOS 4.2. The Print Center icon is only available when a print job is in progress. If the user is not printing anything, the icon will not appear as the task is not running. Print Center can queue multiple print jobs at once. Selecting it when items are waiting to be printed can offer a range of options, including the ability to cancel a job before it it sent to the printer. Selecting a job offers a summary, including the status, time sent, and other details. Printing is only available on iOS devices that support multitasking. That means the iPhone 3G will not allow for wireless printing. Multiple applications can submit multiple print jobs, and they will simply all end up in the Print Center queue. An iOS device has one queue for all print jobs, regardless of the originating application or destination printer. Print Order in the iPad multitasking bar. Screenshot via Apple documentation. To print from a shared printer, developers must currently have the latest beta of Mac OS X 10.6.5 installed. Devices running the current iOS 4.2 beta can print to a handful of printers that support iOS printing, including the HP Photosmart Premium Fax e-all-in-One Printer (model C410); HP Photosmart Premium e-all-in-one Printer series (model C310); and HP Photosmart Plus e-All-in-One Printer series (model B210). Print Summary in the iPad multitasking bar. Screenshot via Apple documentation. iOS 4.2 is set for release in November for the iPad, iPhone and iPod touch. It will also bring multitasking and folders —features that already exist for newer iPhone and iPod touch models —to the iPad. Apple also announced Wednesday that AirPrint will be supported directly by a number of HP printers that support ePrint, including devices in the Photosmart, Photojet, Officejet Pro and Laserjet Pro series. Those devices will allow direct printing without the need for any drivers or additional software. Printer options popover on iPad. Screenshot via Apple documentation.